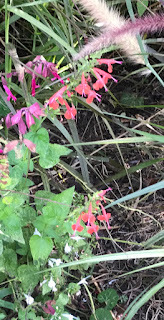 As I was doing a bit of post-Harvey cleanup in the back gardens today, I discovered a Salvia in a shade of fluorescent orange/red that I have never seen in a retail nursery OR in a garden before. 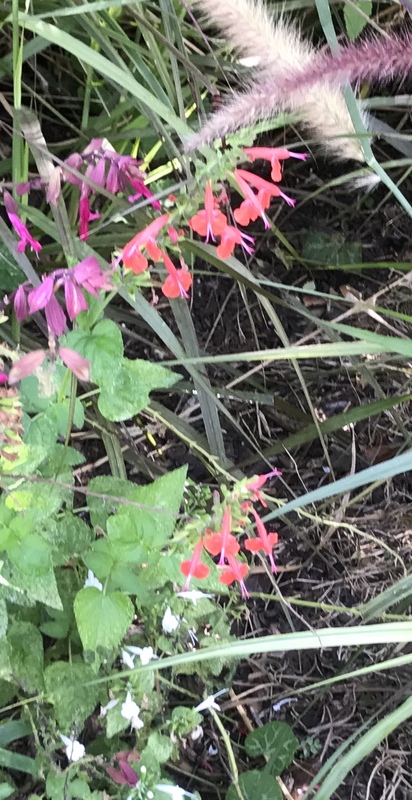 Evidently any sense of botanical decorum is lost in a storm and the salvias abandon all inhibitions to have their way with each other. Salvia coccinea 'Summer Jewel White', Salvia coccinea 'Coral Nymph, Salvia x 'Wendy's Wish' and Salvia greggii 'Raspberry' are all planted in the general area where this hot mama appeared. A closer view of her glowing charms appears below. The Head Gardener is once again convinced our fortunes will be made if we can just isolate the seeds and get them to come true. She will not allow me to name the hybrid, however. 'Whorevey' was already soundly rejected. She objects on the grounds of practicality, too little time having elapsed between the storm and the appearance of these blooms for the cycle of reproduction to have occurred. Nobody believed we could get 32 inches of rain in 4 days, either. The pictures don't do it justice ... the color glows! We're delighted to have pulled it together to participate in Garden Bloggers' Bloom Day, created and sponsored by Carol of May Dreams Gardens. Interesting name for a salvia! Thanks for joining in and happy to hear you have blooms in your garden post-Harvey. Not being on Facebook any longer, I've been wondering how you were doing post-Harvey. I heard that Katy got hit pretty hard. What a thrill to find such a colorful little thing! I love your idea for a name. Good luck on your little hybridizing project! It's always exciting to find something entirely new to your garden and to the world at large. Yes, save those seeds and hope for the best as they grow and bloom. Great color and great story! New varieties have to start somewhere....and it might as well be in that magical spot in your garden. Can't wait to hear what the final name will be! I love it when you find a new plant in the garden. This one is a beauty!